One of the few things your new marketing website can “do,” other than branding, is to build an in-house email marketing list for your business. In our opinion, if your website doesn’t get visitors to leave their contact information, you’ve wasted your money and your visitors’ time. If someone makes the effort to visit your site, there’s a good chance they’re interested in what you have to offer, even if they aren’t going to buy today. It’s simple: give visitors an enticement to receive email from you, and use a form on your website to gather email addresses into a list of email subscribers. Then, send high-quality emails to your email list. This process is the most basic form of email marketing – and it works. Tip: When people sign up to receive email from your company, they must get something of value, not just self-serving blather. Make an effort to give worthwhile information or insights, real bargains or other timely information. First, this article covers some of the most basic enticements, then shows how to fit the contact info collection process into your website. Discounts and specials move product, and early announcement of discounts and specials make the recipients feel that they’re getting valuable information, too. This enticement can appear on your homepage, in the shopping cart or on a confirmation page. 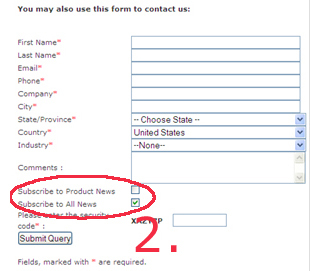 Retailers typically have an opt-in/opt out button in the registration process. Give-aways are a proven way to build up a mailing list. Offer something (not too expensive), then see how much information you can gather from your visitors in your give-away registration form – ask a few questions that they can answer by simply clicking. Gift certificates and iPods seem to work really well! Also, this is particularly good if you want a quick “hit” and are willing to sacrifice the quality of the list over the quantity. Free, expert information and news is a wonderful thing to receive in an in-box. If your company can write up news, trends or opinions about your industry or niche that targets your viewers’ interests, you have the seeds of an online newsletter. If your company sponsors events or seminars, people want to get reminders about times and locations. Try offering discounts to events through email to increase attendance. Industry experts and researchers have data that people want. And you can give it to your viewers in exchange for opting in to an email list. Tip: Keeping contact information in an online database gives you the ability to export and manage your contact data most effectively. Through this process, Intelliden is able to generate an in-house email list that is pure gold. One of the few ways you can measure your marketing website’s success is to see how effectively it gathers sales leads. That means collecting contact information from your website’s visitors in a form. And here’s why that’s important: Once you collect contact information, you can start using one of the web’s most effective and efficient marketing tools – email.